Caption slip reads: "Monday. Photographer: Gaze. Date: 1951-08-31. Reporter: Gaze. Assignment: 40th Division baby left. 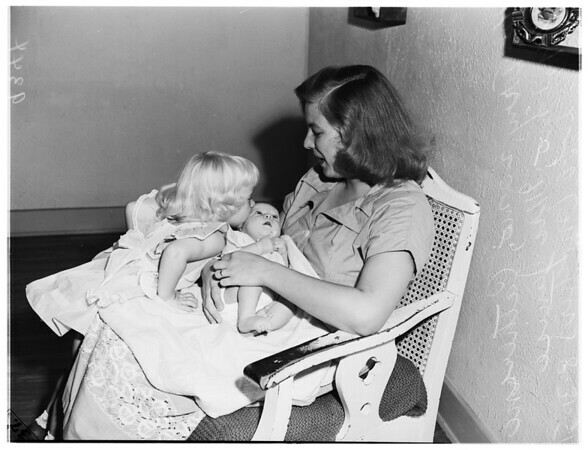 All of enclosed negatives are of Mrs. janice Leff with her month old (today) baby, Catherine Joy, or of Terry Leff, 20 months old, with sister, Catherine, or both. Mrs. Leff, who lives at 38 Avenue 20, Venice, is wife of Joseph W. Leff, 0986081, Headquarters Battery, 143rd Field Artillery Battalion, 40th Division, APO 6, 5 Postmaster, S.F.". Edits: "Born July 31, had first picture taken today, Aug. 31".